Bimodal IT has been the topic of great debate amongst both DevOps and Traditional IT enthusiasts. Hands on practitioners realize that IT will always be biomodal because certain functions require a waterfall approach like building out infrastructure. DevOps enthusiast worry about legacy processes impeding progress and business agility. The missing link is building a bridge between development methodologies using a common language and tool - Business Requirements Document. 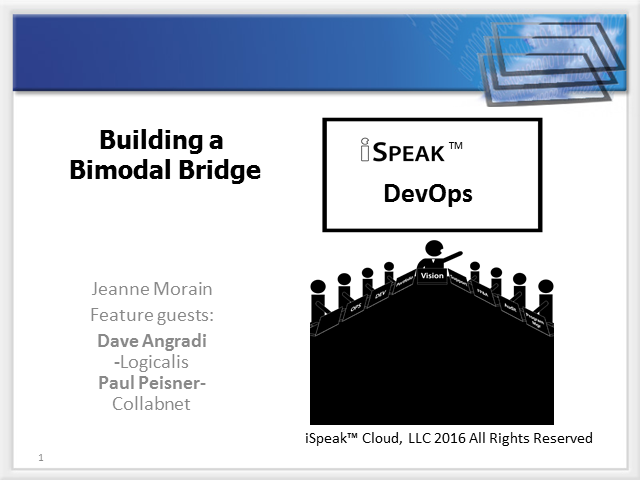 Join Jeanne Morain and special guests - Dave Angradi (Logicalis) and Paul Peisner as the provide prescriptive guidance on building the Bimodal bridge to reduce friction while enhancing agility, time to value, and benefits of DevOps.